In the current startup ecosystem of India where so many new startups are joining the industry and where it has become comparatively easy to get funded by venture capitalists, it was like moving around in a familiar world while reading this book by key decision makers of the Google - with somewhat different startup culture. In fact, Google has been so indispensable to a person's average daily life that he uses Google's product in a way or another: be it Android devices such as phones, tablets or camera or using Gmail and chrome browser or searching for anything on the web. But, then Rome was not built in a day. It took them few years and efforts of many creative persons to be where they stand today. 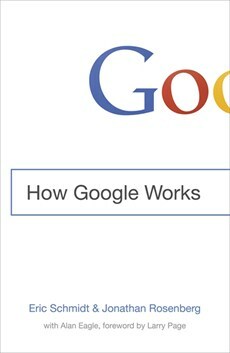 In the book 'How Google Works', Eric Schmidt, Jonathan Rosenberg, and Alan Eagle have described in detail what does it take to build one of the most successful startups. We all have been curious at one time or another about the work culture or ethos of companies such as google. Well, this book describes those things in a lucid manner, things which were hitherto only heard as social media posts. Eric Schmidt was brought to Google by the investors as it was thought that It would be good to have a person experienced in business who will be mentoring co-founders of google with purely engineering background. Being himself an engineer, a Ph.D. from UCB, Eric could understand the focus that was given to engineers in Google. In fact, Larry Page insisted that engineers should be more than fifty percent of the total workforce. Jonathan had a degree in economics and had experience in managing products at Excite @Home, before joining Google and leaving in 2011 as SVP of products. The book has been divided into six sections - Culture, Strategy, Talent, Decisions, Communications and Innovation. In the introduction of the book, authors talk about top-down and bottom-up management approach. The theme is that never impose ideas on anyone. Give space to all the employees, so that the ideas can flow both ways. What Larry Page used to say is that let us go and talk to engineers, they must have some idea for this problem. In the same section, authors talk about the 'smart creatives' - a phrase used too frequently throughout the text but conveys a lot of meaning about the type of people working in Google. To quote the authors themselves : "A smart creative has deep technical knowledge in how to use the tools of her trade and plenty of hands-on experience. She is analytically smart. She is business smart. She is competitive smart. She is user smart. A smart creative is a firehouse of new ideas that are genuinely new. She is curious creative. She is risky creative. She is self-directed creative. She is open creative. She is thorough creative. She is communicative creative." Talking about the google culture, authors say that before you convince others about your slogans, you must believe themselves. They should not be empty words composed to impress the outsiders. This was the reason why co-founders included a letter to prospective equity holders while going for the IPO, although SEC initially said that it does not convey any useful information about the IPO. On one day, while talking about what one should wear at Google, Eric said, "You must wear something." Eric talks about the facilities provided to the Googlers. He is of the opinion that when you have rockstars in your team, you should give them things like free food, good computers etc. In a technology company, any employee should get the benefit of infinite computing power available. Eric also says that messiness is not that bad, but it is a virtue if it is accompanied by creativity and innovation. In a chapter on Strategy, they emphasize on the path they took to survive and win the competition. In a nutshell, they say that always base your product on technological innovation, not always what customer demands, because a customer might not have imagined that certain technology is possible. Also, do not roll out products based on market research because that strategy is good for the companies fighting to get an edge in a status-quo market but it does not suit a company aspiring to be disruptive in the way people live their life. In this chapter, Eric takes an opportunity to explain his stand on open source ecosystem. Opening intellectual property is unlike the traditional approach where you create a competitive edge and then seal the doors so that the trade secret does not get out. He also says that reason for not opening Google search's codebase arguing that it may hamper the quality of the web search that folks will offer who will fork the codebase. In the chapter on Talent, the authors talk about hiring do's and don'ts at Google. They say that an interview should not be scheduled for more than thirty minutes and interview feedback should be filled as soon as possible by the interviewer. They inculcated a culture at Google where interviewing was not a mundane task but Googlers were motivated for interviewing and it was part of their key responsibilities at Google. Authors say that those who are passionate about their work do not use the word 'passionate.' They show their work in the relevant field to show their passion. Even if it urgent to hire a person for a position, do not lower the bar to get employees hired. When a person is hired, give them with disproportionate rewards. In a chapter on Communications, authors give their insights on how to communicate better in an organization. They say that it should be safe for a person to tell the truth and he should not be afraid to give his opinion. An employee should know the details of the product they are working on, not because they have memorized or learned by heart, but because it is their product. Also, Eric innovated a new way to break the routine nature of meetings and the idea he put was to present a trip report of a trip taken before that meeting. Eric also gives some tips on handling emails. This book was very much like a story being told and authors have narrated many incidents from their decade-long stint at Google. These incidents maintain the flow of reading. Also interesting are the ideas that we think can be applied in other organizations. Authors have also revealed few acronyms started by Googlers like HiPPOs (Highest Paid Person’s Opinion) and TGIF (Thank God, It’s Friday). Recommended for people who will build the future and will like to attract the best talents for their endeavor.